I think it'll take really bad weather for melt in July to close the gap to 2012 before August. The shallower anomaly troughs do tend to be broader ones and there's still a fair amount of the Svalbard blob to go, so I reckon 2017 has a rather better than evens chance of extending its lead during July before falling back again in the remainder of the melt season. The rate of sea ice pulverization and vertical mixing of ocean water is very difficult to estimate, given that many areas remain cloud covered and to assess how much overturning and mixing is there is hard to see. When ice is sufficiently broken down, the winds do not need to be as strong as in the past for large transfers of heat between ocean and ice to occur. The more pulverized and well mixed sea water becomes more stable the temperatures may appear. This means that the temperature tend to be suppressed the more scattered and broken sea ice becomes. Sea ice is most broken at the rear where it is bathing in sunlight and heat, but also exceedingly broken on the Atlantic front meaning that much more heat can be taken up despite seemingly cold air. There are pictures showing some areas very battered ice. The ice does not only erode by surface and bottom melt, but by the ice floes pounding against eace other when spatial viscosity lowers. These graphs show how extreme the volume loss was in 2012, while emphasizing that 2017 has maintained a large difference with 2016. Compared to 2016 the ice is still much thinner and the only reasonable expectation from that is that the amount of area / extent loss will be much greater from now to the end of the season than in 2016, 2017 is much more likely to follow the trajectory of 2012 than 2016. Here is a comparison to current hycom followed by a progression to thinner ice with Atlantic Water corridor ice removed, without re-dispersion, up to the end of September. Recall last fall that the melt season overlapped considerably with the re-freeze season, depending on location and date. Note how Piomas has returned from its long eccentric odyssey to again resemble hycom and sea ice age along the CAA. Only the Inner Basin gap relative to other years has any interest; for example ice along the greenland coast has racheted out of relevance and should not be used in inter-year volume comparisons. It never returns to the Arctic Ocean once the 80th parallel has been cleared, nor do its melting floes cool northbound Atlantic Water (which is well to the east at 300m depth). Another effect distorting comparisons this year has been pile-up of ice along the Svalbard-FJL-SZ line. Unless persistent winds somehow reverse the Transpolar Drift, better guidance will result from deleting all ice volume south of the ~1000 km Barents Bathymetry Break before figuring gaps relative to prior years. This masking step is shown in the next to last frame below but so far has not surfaced in our line graphs or grid cell eliminations. It would be great if people who lump/gap the whole Northern Hemisphere instead of the Inner Basin (as modified) out to D90 could explain their thought processes. I wouldn't bet the farm on a D1 for the western US. The real question though is whether inter-year inner-basin volume comparisons (say 2015-17 to earlier) still make sense. At one time, subtraction (ie relative volume change) took out shared error in the algorithm but in a 'New Arctic' increasingly dominated by dodgy first-year ice, that is a dubious proposition. Here is a comparison to current hycom followed by thinner ice and Atlantic Water corridor ice removed, without re-dispersion, up to the end of September. Excellent figure that shows how dangerously thin the ice is now, A-Team. If I were to bet I would put in a slightly higher extent than the figure shows because compaction will help preserve some of the thin ice. I think the pic A-Team is presenting is somewhat bullish and I don't see a new record minimum ahead of us. While waiting for the more detailed and regional data, here's my stab at total volume extrapolated to the end of July, using the "typical-low melt" figures, which basically are the same numbers as 2012 (no volume cliff came about for 2012 in July) and unsurprisingly keeping 2017 with the same slight lead. Other numbers from the top melt years would carry 2017 further into the lead. The first black dot is Wipneus' calculation of the current number, the next two are extrapolations for mid- and end-July. PIOMAS update is available. Just under 2012. Extent just under '12 too. Ice quality might be considered far worse, though. Next four weeks of weather will be decisive. Fram export was low last month. Monthly and daily graphs attached. Area per thickness categories . None of the categories on 30th June is a good proxy for the "final" area. That will be different for the mid-July update . The thickness graph for 30st June, compared with previous years. Very interesting to have the gap with 2012 close, but at the same time see this huge discrepancy, an almost diametrical opposition, on the comparison map. Sure, 2012 will catch up with the dark blue in the Chukchi and ESS where the ice has disappeared quickly this year, but the same goes for 2017 with all that red on the Atlantic side, especially that big blotch north of Svalbard and of course Baffin Bay. And then there's that last zone of red, in the CAA, that has received plenty of sunshine during the past few weeks. It implies that it should be more than possible for 2017 to keep pace with 2012. Very interesting race indeed. I will be away from my computer for some days but have made some calculations analyzing the "inner basin" volume gap. Pray excuse rounding errors and no chart. Note: all my "averages" include only 2010, 2011, 2012 and 2016. Numbers are in km3. First, 2017 had a slightly above-average inner volume loss, 2460, reaching 10,656 on day 181, compared to 2012 at 11,480 and 2011 at 11,333. Looking at losses to day 196 (mid-July) with a clustered range of 2539-2691, and assuming low-typical 2550, extrapolated 2017 will get to inner basin volume of ~8,100 and lead of ~680. Race not over. (But of course August was the real freak). Looking at regional distribution and the comparison maps, it's mostly a tale of Pacific side vs. Atlantic side. As the Atlantic side is much more vulnerable, I would say it's one more advantage to 2017. On the other hand, 2012 had ice left only in CAB and CAA at minimum (besides Greenland sea) and the lead in these two regions has almost vanished. ...t should be more than possible for 2017 to keep pace with 2012. July and August behavior are--very obviously--going to make a huge difference. Thanks Jim - I'll be sure to sleep better tonight. 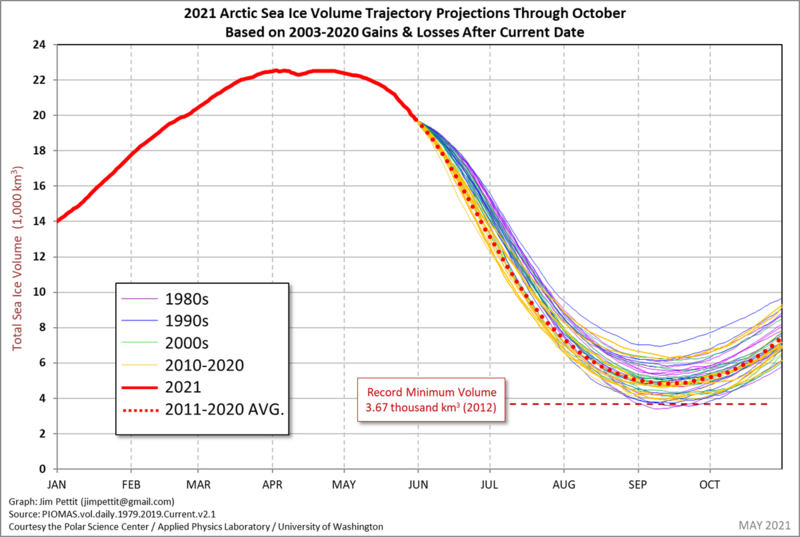 My PIOMAS graphics have also been updated for June at http://sites.uci.edu/zlabe/arctic-sea-ice-volumethickness/. I think that it might be worth pointing out that the monthly value for June came out to 15.4 km3 and was 500 km3 less than the previous record for June which was set in 2012. Also. June of this year saw a value that came in under 2016 by about 1000 km3. There is a sizable difference in the monthly numbers as opposed to the slighter difference in the end of the month volume numbers. I would think this to carry more weight in comparing years than the day of the year numbers. Latest PIOMAS update has been posted on the ASIB. Jim, this does not make sense. Since 2017 and 2012 are in a virtual tie for volume right now, your remarks suggest that 2012 had the smallest volume loss of any year on the record (from July to September), except for 2014. Is that true ? I am no expert but if what you are saying is that from July onwards, 2012 lost a lot of extent but not an anomalous amount of volume then my take would be that it latterly lost a large area of very thin ice, leaving the thicker core relatively normally affected. That way the extent declined heavily but the volume declined normally. Does that make sense? Other than that it could just be inaccurate volume measurements. Yes. Looking at A-Team's recent graphics on the 2017 melting thread (p. 52, based on Hycom data), I'm not sure whether we shouldn't be expecting the same this year. The lack of thick ice, and the rapid thinning from the Siberian side, looks very like the start of a 2012-type extent crash. If I understand it right, a significant proportion of the thicker ice that's left this year (e.g. N of Svalbard) is practically doomed; so on balance, it looks to me as though we should expect a sustained extent drop for the remainder of the season, AND a large volume drop. A lot of people have been thinking of 2012 as an extreme outlier that we're unlikely to match for the rest of the season. What I'm seeing (and some others here, I know) suggests that this year can still be even more of an outlier. So, again, a repeat of any of those years but 2014 would leave us with a new record. The normal volume pattern post 2007 is big to very big losses in June and small to average losses in July/August. 2012 had a very big June, a small July and an average August. During the last decade, melting out exceptional amounts of ice in June has been followed by finding the remaining ice a bit harder to melt than normal. The volume in April 2013 was pretty much back where it was in April 2012, and part of that was slow July 2012 and the rest was high freeze rates. The melt given up in July is rather less than the amount gained in June, so a big June still means June+July is big, but the record anomaly happens at the end of June. It is obvious that the early seasons in the past have recorded large losses by the end of June. This is mainly as the increased melt rates hit the easy-to-melt peripheral areas first where volume losses occur. The small 'core ice' region of the Central Arctic around the North Pole is small in areawise. It is always this ice that melts at the end of the season. If winter sea ice area growth is low in the peripheral seas, it depresses the easy-to-melt volume in June like in 2012. So one cannot have a huge volume loss in June if the vast outspanning areas melted earlier in the season or did not form ice in the first place due to a warm winter. In the past (when the core area of ice hardly melted at all) ice like the Lincoln Sea was several meters thick! 2017 sees fractured and pulverized ice even in CAB, this was not the case in the past. And a slow 2014 melt is already improbable, given the vast open areas close to the CAB, which means the sea in many places has become a solar radiation collector. 2014, if memory serves, still had vast – or at least well above average – area and extent in June. It's going to take weather to slow down volume loss sufficiently for a new record to be prevented. I can't remember exactly what killed it in 2014, but it was probably very uneventful weather (what I call neither fish nor flesh), no high highs or low lows. Just clouds and little wind. as i proposed (and predict) earlier, we should start to pay more attention to percent difference than to differences in numbers the closer we get to the "null" line. similarly i vote to put into account from where we are coming from. if we start at 3000 of a given measurement we can't expect to loose 2000 thousand in one months. so the lower we start into the melting seasons the less can we compare the rate of loss with earlier years because if we do we shall sooner or later expect impossible, i.e. sub zero numbers and since that can't happen hear things like the decline has come to a halt or the rate of decline has slowed down, while in reality it has not. with predict i mean that sooner or later everyone will recognize that the old way of comparing things and looking at what happens will not serve the purpose anymore. If or when the mid-month numbers come in, I think the report might be a shocker. Just looking at the JAXA volume chart by Wipneus, and it seems to have corrected itself from all the pseudo super-thick areas that were previously showing on the JAXA thickness chart. Although it shows volume at below 7,000 km3, I don't expect PIOMAS to be quite that low. It would not surprise me if it has dropped more than expected, though. 2012 has the third lowest volume loss (10.96) in the record after 1996 and 2014. However it is worth noting that the trend for volume loss after 30 June is decreasing!. The graph shows the 30th June volume, and total volume loss along with pre and post 30th June loss figures. 2012 has the third lowest volume loss (10.96) in the record after 1996 and 2014. Thanks for the interesting chart DavidR. Here's a partial explanation why 2012 lost less volume post-June than other years. It had very little peripheral volume to lose. It's like watching a ship sink. The air inside the hull maintains buoyancy while it slowly bleeds out until the buoyancy threshold is reached at which point the ship sinks suddenly. ... The graph shows the 30th June volume, and total volume loss along with pre and post 30th June loss figures. It's more like 2022 which fits with the projection for an ice free September. Mid month update of gridded daily data has arrived. The volume gap with 2012 is still there, it is still small (0.15 [1000 km3]). Here is the animation, more info later today. Many people keep quoting extent alone and say there is not much melting, but watching the thick ice melt like ice cream is a wake up call. By thick I mean the proxy ice we have for thick now. Curious to see how this loss will translate into numbers. The "island" of purported "thick" ice north of Svalbard shows up as low concentration in recent area maps, which seems to be borne out by satellite imagery. Is this just normal PIOMAS modelling error (potentially), or is PIOMAS having trouble this year? I have been watching this area and the discrepancy there is striking. PIOMAS has been piling ice against Svalbard for months. That movement towards the islands was visible on the tracking I did in AMSR images but later when it relaxed and slightly reversed in July water opened north of Spitsbergen but ice has still compacted against Nordaustlandet. What the satellite images don't tell us is how thick the floes are, but the dispersion should show as thinning on PIOMAS. I think the high-concentration ice next to Nordauslandet is what PIOMAS "means" when showing that blob, with somewhat wrong location. By end-July this whole blob might be gone. Updated daily volume and daily volume anomaly graphs. As usual, thank you for all the updates. Note one day is missing at the end, ~9.05. Turns out the 2017-2012 gap closed by about ~150 on the pacific side, and by ~150 in the CAB, while in the periphery the 2012 advantage shrank by ~300 on the atlantic side, keeping the same total volume difference. Graphically, 2017 seems to be losing steam in the CAB, while 2012 has the GAC visibly waiting. Time will tell if the remaining pacific advantage can be translated to an acceleration in the CAB. The weather vs thinness "game" ain't over till it's over.